A veterinarian can better pinpoint the cause of your cat's hair loss when you share accompanying symptoms. If your cat's belly looks like Vin Diesel's head, it's time to call a veterinarian. Cats lose hair for many reasons, some dull, some dire. Watch for other clues -- like itching, biting or weakness -- to narrow down potential diagnoses. You should never have to buy a cat toupee. All cats, even so-called hairless breeds, shed fur, but excessive or site-specific hair loss can indicate a variety of medical conditions. If your cat loses an abnormal amount of hair on his underside -- enough so that you're reading up about it on the Internet -- schedule a veterinarian appointment. This is doubly important if your cat is obsessively biting, licking or scratching his underside, as this behavior can lead to secondary wounds and infections. If left untreated, hair loss itself leads to hairballs, but its underlying cause can develop into a serious medical condition. If your hair-losing cat is itching himself a lot and seems like he has a cold, he may have food or environmental allergies. Changes in diet or space can trigger allergies, but they can also develop to familiar foods and plants over time. Try reversing recent changes and swapping meals. 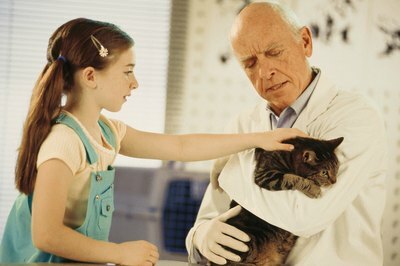 A veterinarian can perform a broad allergy test for a more acute diagnosis. Improper diet leads to hair loss, including on your cat's underside. The easiest way to ensure your cat has proper nutrition is to buy a commercial cat food with the phrase "complete and balanced" on the label. Hyperthyroidism is one of the most common feline disorders that causes hair loss. Other symptoms include weight loss, insatiable appetite, excessive thirst and urination and diminished grooming. The conditions chimeric twin, hypothyroidism, is rarer, and -- along with hair loss -- causes weight gain, weakness and lethargy. A compromised immune system often leads to hair loss, although it's not usually confined to one region of the body. Cancer follows a similar course. Atopy, a disease characterized by hypersensitivity, affects a small number of cats. It typically leads to loss of hair around the underbelly, base of the tail, feet and face. From bug-sized specimen to microscopic villains, a range of wee beasties can cause cat hair loss. Fleas and ringworm -- the latter of which, despite its name, is a fungal infection -- can infest and pass among pets and humans. A medicine cabinet's worth of treatments are available. Secondary bacterial infections often occur in wounds from licking, biting or scratching and are sometimes the primary cause of hair loss, as well. That's called pyoderma. Species- and pet-specific mites, much like fleas, become obvious as hair loss leads to higher visibility. Some cause manage. Cats get emotional, just like humans. Stress, anxiety, fear, nervousness, conflict and boredom all lead to over-grooming and hair loss. Psychogenic alopecia -- the latter medical term references hair loss, at large -- is typically diagnosed after other conditions have been ruled out. Changes in routine and environment are stressors for cats, who are notorious creatures of habit. Another cause of otherwise unexplained hair loss is hormones. As cats mature, their endocrine systems shift hormone production, including those responsible for hair growth. Phases of hair loss may come or go, but usually subside in adulthood. Stud tail -- a condition wherein overactive sebaceous glands lead to oily hair and hair loss -- typically affects the top and sides of a cat's tail base, not his underside. Pregnant and lactating cats also sometimes shed stomach hair. What Causes Cats to Lose Fur around Their Necks?